Graham Coxon’s guitar playing was what got me into Blur despite my initially being put off by Damon Albarn’s… well, Damon Albarn. I’ve since grown to really appreciate Blur for everything that they were. Of course, in typical UK fashion, neither of the principals’ projects outside the band have really done much for me. But while you could probably successfully argue that Albarn has been the more adventurous and experimental of the two with his post-Blur projects, I still prefer Coxon’s guitar poppery (at least now that he’s gotten over his American lo-fi worship phase). 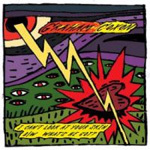 And so it is that I’m happy to be able to give away, courtesy of Cornerstone Promotion, a copy of Graham’s double-7″ single for “I Can’t Look At Your Skin”/”What’s He Got?”, taken from his latest solo record Love Travels At Illegal Speeds. Yes, that’s right – vinyl. You do have a turntable, don’t you? Of course you do. In addition to the two a-sides, you also get a couple b-sides, “Outta My League, Dear” and a Libertines cover, “Time for Heroes”. Huzzah. To enter, leave me a comment on this post telling me your considered opinion if a) Coxon will ever reunite with Blur and b) if that’s actually a good idea or if they should just let it be. I’m actually split on the matter – it’s not like they’ve been broken up for an especially long time, there’s not any real reason they couldn’t pick up where they left off… But anyway. That’s the criteria. Be sure to use your proper email address when commenting. Contest closes at midnight January 28. Modern Life Is Rubbish 2007 I guess! It might happen. I really doubt it. I would loooooove it if it did. Battery In Your Leg is wonderful and makes me want more of that style of Blur, but with Graham’s guitar. Another 13 would be neat but I think their recent sobriety is gonna quash any chance of that happening. a) Coxon will ever reunite with Blur and b) if that’s actually a good idea or if they should just let it be. I can see it happening but not for another couple years. They both have enough projects to keep them busy and if this the Good, the Bad and the Queen does well, Albarn will ride it out while it lasts (like he did with Gorillaz). I do hope they eventually reunite because of the possibility that they somehow create another ‘Parklife’-esque Blur record. Blur had a good mix: Damon gave attitude; Graham’s hooks and riffs put personality into their songs. Think Tank was, in my opinion, a good album, but somehow I found that Coxon signature missing in the tracks (save for one song). Damon is a good front man and really does have a way with his audience, but it was Graham’s guitar work that really got me into listening to Blur. It would be great to see Graham perform with the boys again even for just a one-off reunion thing, but given their current chosen career paths, side projects and what-not (most probably personal issues, too), I don’t think it’s gonna happen any time soon. It’s a possibility, but now is too early for something like that. I do hope they can pick up where they left off, even just for posterity’s sake. The boys have good things going for them at the moment; I don’t mind if they take their sweet time getting back together. And I’m still enjoying Graham’s solo stuff, so it’s all good. a) Blur will probably reunite at some point. After all, reunions are all the rage these days – just look at that Coachella lineup! b) I do think they should let it be. Think Tank was not a very good album, and Damon just didn’t seem to have fun playing in Blur, so it’s probably better for him to find other avenues for his creativity (like The Good, The Bad and the Queen, or Gorillaz). Plus, Damon can be an egomaniacal jackass and those last couple of Coxon records have been corkers, so it’s probably for the best if they keep their separate ways. There’s no doubt that Blur was best with Graham on the guitar. I don’t think that any of their other projects – Graham solo, Gorillaz, or even Fat Les (!) – were as good as Blur were when they were really on. For that reason, I’d like to see Damon put down his ego, Graham try to reconcile, and start to play together again. I think that it’ll happen eventually, because it doesn’t look like anyone wants to call Blur "over," and eventually they’re going to realize that they’re better off playing together. Until Graham is back, the band isn’t Blur and I’ll keep wearing my Mogwai shirt that just says "Blur: Are Shite". I never liked Alex James from Blur, but I am a fan of his Fat Les side project. The "Vindaloo" single made 1998’s World Cup complete in my view. Anyone ever see the video with Keith Allen and that Dennis Pennis guy? Hi-larious! I have a hunch, though, that by the time they do resolve their personal differences Blur will have lost all relevance. It’ll probably just result in a bunch of middle-aged men anemically rehashing "Popscene" on an overpriced reunion tour. i think way on down the line after all of albarn’s other projects have dried up and he has nothing better to do, he’ll give coxon a call. considering the fact that the time probably isn’t far away, then it will probably be soon and coxon won’t be done with his solo stuff yet. coxon will shoot him down and albarn will start trashing him in nme. for albarn – yes. for coxon – no. i think i like coxons last two records more than any of the blur records. im probably pretty lonely in that viewpoint however.